Treat yourself to a soft and sweet detox smoothie which tastes so incredibly good you’ll never want to put it down! 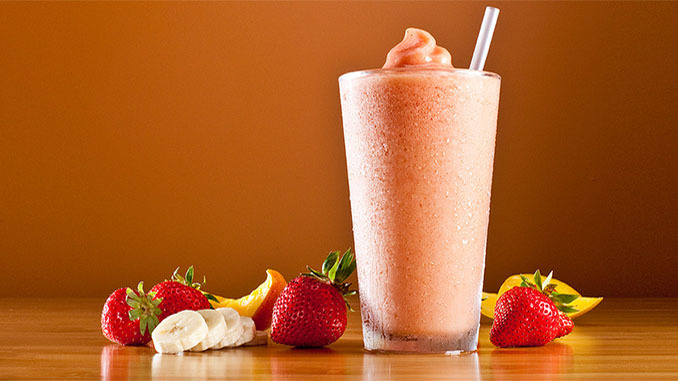 The strawberry banana detox smoothie recipe below takes only a few minutes to prepare and offers numerous health benefits that you can enjoy while drinking. Bananas are high in potassium and also contain magnesium which is great for treating hangovers and dehydration. These are both also important elements in maintaining kidney health and glowing skin. As for strawberries, they actually have one of the highest levels of vitamin C. The bright red color of each berry tells you they have a high level of antioxidants and are extremely good for the body. The final piece to this recipe is yogurt. It’s one of the best foods to maintain healthy gut flora. It can also prevent the growth of harmful bacteria and yeast imbalances within your body. Take a few minutes to make this yummy strawberry and banana detox smoothie to see how you like it yourself. Makes two servings! Note: You may use any type of milk. That includes skim, soy, rice, or even goats’ milk. 1) Wash strawberries with water and cut off the stems. 3) Place all the ingredients into your blender. 4) Blend the ingredients until smooth. 5) Pour into a tall drinking glass. Once you’ve completed each of the five steps above you’ll be all set to begin serving and enjoying! Drink one or two glasses of this delicious smoothie each day and you should almost immediately notice health improvements such as a better mood, rejuvenated skin and even some weight loss!